boku no koto wo karakattano? yatsu no doko wo ki ni ittano? Another Golden Bomber song which also appears in the jubeat plus ゴールデンボンバー pack, 眠たくて, shares the same melody of 女々しくて. 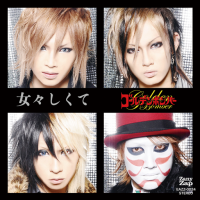 女々しくて is Golden Bomber's seventh single. This single reached the Oricon Weekly chart #77 and the Oricon Indies chart #4. 女々しくて features its music video in DanceDanceRevolution, which is full-screen and eliminates any on-screen dancers. 女々しくて is the only new license in DanceDanceRevolution X3 VS 2ndMIX that features its music video. 女々しくて is the only new license on pop'n music 20 fantasia that is not a cover. As such, it does not have an audio preview on the pop'n music 20 fantasia homepage, nor does it appear on the pop'n music 20 fantasia original soundtrack CD. In REFLEC BEAT colette -Winter- and DanceDanceRevolution (2013), the jacket for 女々しくて was changed to the same jacket used in jubeat saucer and DanceEvolution ARCADE, while the original one continues to be used in jubeat plus. As of pop'n music Sunny Park, instead of displaying its character's portrait, 女々しくて displays its album jacket. While in pop'n music éclale, 女々しくて displays ロミ夫 instead of its jacket on the versus screen, it shows his 純愛ホスト☆午前5時 portrait instead of the unique one that had in pop'n music 20 fantasia. 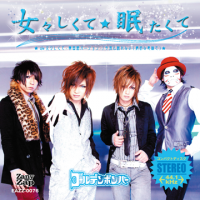 女々しくて's DanceDanceRevolution CHALLENGE charts, which include Shock Arrows, were written so that the player's movements would be similar to those of the members of Golden Bomber as seen in the video. Single CHALLENGE: 78 Shock Arrows, behind Summer fantasy (Darwin remix)'s 83. Double CHALLENGE: 81 Shock Arrows, behind Summer fantasy (Darwin remix)'s 92. 女々しくて received an EASY chart in pop'n music Sunny Park, replacing its old 5-Buttons chart. 女々しくて was added to the BEMANI Category folder in pop'n music Sunny Park. 女々しくて was added to GITADORA on July 10th, 2013. 女々しくて was one of the qualifying round songs in the KONAMI Arcade Championship 2013 for DanceEvolution ARCADE. 女々しくて [ 2 ] can be unlocked in jubeat prop's Step unlocking system, by reaching Step Level 25. These charts were added to jubeat plus as alternate Hold Marker charts for 女々しくて on November 6th, 2015. As of jubeat Qubell, it is available by default. 女々しくて was removed from REFLEC BEAT VOLZZA 2 on October 3rd, 2016. 女々しくて was not included in the North American location test of DanceDanceRevolution (2014). Subsequently, 女々しくて was also absent from the North American release of DanceDanceRevolution A. 女々しくて was removed from the Asian releases of DanceDanceRevolution A on November 7th, 2016. 女々しくて was removed from pop'n music éclale on December 5th, 2016. 女々しくて is one of the 2 Players/みんなでBATTLE exclusive songs in DANCERUSH STARDOM. It was available for play from April 27th to May 6th, 2018. It was available again from June 8th to 10th, 2018. It is permanently available from June 15th, 2018 (though it is still limited to 2 Players/みんなでBATTLE). From July 13th, 2018, it is available on all modes. ※ The notecount of this chart is different from the old 5-Buttons chart (total notes: 138). This page was last edited on 2 February 2019, at 16:54.